An evening of beautiful music from two of New Zealand's rising stars who come directly from the major roles in the New Zealand Opera Company production of La Boheme. Singers Marlena Devoe and Julien Van Mellaerts together with pianist Terence Dennis will give three concerts in New Zealand before they return to their careers in Europe. 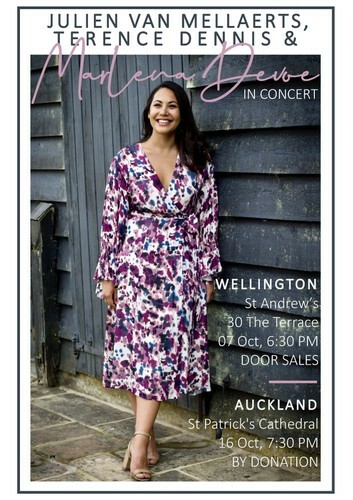 The program for the Auckland concert at St Patrick's Cathedral will include the Lieder of Schumann and Strauss, French Mélodies of Debussy and a selection of Arias. This is an opportunity not to be missed. Entry by donation at the door will be appreciated. Marlena is fundraising to help with the costs of her continuing tuition in Italy. Validated parking will be available at the Wilson car parks on Hobson Street ($4) or Durham Lane ($2). Please bring your parking ticket with you to the Cathedral to be validated.